Going by the amount of shelf space in even the largest travel bookstores, the region between Nantes and Bordeaux holds little promise. I found only one book, a slim green Guide Michelin, at Stanford's in London's Seven Dials area. And it is true, the central portion of France's Atlantic Coast is short of spectacular attractions. While La Rochelle has a noble history of heroism and upheaval that's reflected in its fortifications, the countryside is rather quiet. There are peaceful villages on reclaimed land, endless beaches, and charming seaside resort that must heave with holidaymakers in summer. But in late May, the coast is still deserted. An hour's drive inland from La Rochelle is a small town whose fortunes don't depend so much on the seasons. Cognac has given its name to one of the greatest brandies and the town and its surroundings are home to several hundred cognac-makers. Many of the businesses in the area cater to tourists much like vineyards do, offering tours of their premises and tasting sessions. Years ago, I toured some vineyards in Napa Valley. While the big operations like Beringer offered professionally polished tours, smaller, family-owned vineyards exuded a personal warmth that I found much more welcoming. Sometimes the proprietor would come out and proudly uncork his favorite bottle. My idea for this current trip was to recreate that experience. I had once encountered the product of a smaller cognac-maker, Jean Balluet from the village of Neuvicq-le-Château, and decided to visit, leaving out the big names that are resident in Cognac itself. Neuvicq is not easy to find. It exists on the map, but one has to get rather close before seeing the first road signs. I arrive there around lunchtime, and the place is deserted. The unadorned façades of timeworn limestone houses are darkened by fungus, oxidation and moss. Most shutters are closed; there is no one in the streets. 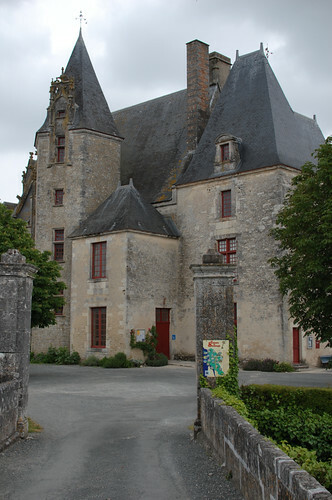 The eponymous château, its current incarnation completed before the advent of the Renaissance, dominates the village. It seems higher than wide and is crowned by chimneys, turrets, steep roofs of deep slate, and a fat tower. There's a post office inside and a concert hall for chamber music. The post office is closed. I see a sign for "Vignoble Balluet" and follow it enthusiastically. When I see the second sign, it points in the opposite direction. I have gone too far, but I saw nothing on the way. Ping-ponging between the two signs a few times, I narrow it down to a complex right by the road that reminds me of cold-war army barracks. The main building is a concrete monstrosity with an observation point not unlike an East German border guard tower and doesn't conform to my romantic notions of artisanal spirit production. There is no sign advertising the nature of the operation inside the windowless complex, but outside are huge stainless-steel tanks sparkling in the sun. They could be used to store wine before distillation. I enter through the front gate. There's a sign in the door asking unnamed addressees to go to the first house after the intersection when no one is around. Then I see the doorbell. It says J. Balluet. I ring it, but there's no one around. I go to the first house after the intersection whose open door is guarded by a lazy dog. I don't want to test his vigilance and shout bonjour from a distance I judge safe. The dog comes slowly up to me and sniffs my crotch. A couple come to the door, forks still in hand. They're having lunch. If it were Sunday, I'd be doomed, but it's Saturday. They tell me, not unkindly, to be back in an hour. The distillery will then be open for tours. I go back to the car and, leaving for the nearest town to have lunch myself, pass the house again. The door is now shut and the dog inside. All traces of human presence are gone. I as drive from the village I marvel at the surroundings. For a region famed for a specialty derived from wine, there are surprisingly few vineyards. The terrain is hilly but only just. Rough plain would describe it just as well. Without the slopes that characterize many other viticultural regions, the grapes literally grow in fields. They do so in mixed culture, next to fields of rye and lettuce and flower-studded meadows. Extended stretches of wood and forlorn coves absorb the view in all directions and break up what might otherwise be an artificial landscape. No doubt, man has subjugated nature for his benefit. But he has done so gently and with respect for the identity of the land. It's a concept the French call terroir, and the quality of the products derives from it. After lunch, I'm ready to sample the quality of Jean Balluet's cognac. This time, my ringing the doorbell is answered, and I'm asked in. The first stop on the tour is the storage room, cobwebbed and dark. The six dozen barrels are the second thing I notice. The first thing is the sweet smell of cognac that suffuses the air. I breathe it hungrily. The walls of the room as well the barrels are blackened as if a fire had ravaged only weeks before. But it's not that an earlier visitor has ignored the No Smoking sign by the entrance. No, a particular kind of fungus grows on the alcoholic fumes that evaporate from the barrels. Its colonies appear deep black (and help state inpectors ferret out illegal distilleries). The next room is where the grapes are delivered after the harvest. Big machines remove the seeds and skins from the juice, which is left to ferment naturally over twelve days. That's what the stainless-steel tanks outside the building are for. The result is not fit for the table and can't possibly be called wine. It goes into the gas-fired copper still in the adjacent room that turns 600,000 liters of fermented grape juice into less than 100,000 liters of spirit, 70% strong. The still is fired up when fermentation is complete and continues for four months. Two kinds of beverages are obtained from this eau-de-vie. A portion is mixed with an excess of fresh grape juice and matured for eighteen months to create Pineau des Charentes, a sweet aperitif that's best consumed ice-cold. But the majority goes solo. Sloshed into huge barrels of Limousin oak, it assumes its characteristic taste and color by interaction with the wood of the barrel and by oxidation. The barrels are all stored in dark barn-like structures; there are no cellars. 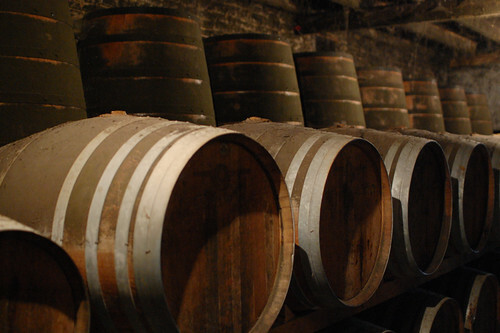 Like all aspects of agriculture and related businesses in France, cognac making is strictly regulated. Cognac is a protected name reserved for spirits that are distilled in the traditional way, using a copper still, in the Charentes region. 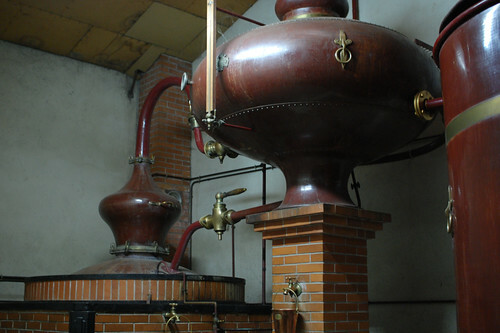 The distillate must age for a minimum of two years when entry-level cognac is ready for bottling. It gets a brazen Very Special (V.S.) label but is rather ordinary. What remains in the barrel improves with age, becoming smoother with every passing year. Very Special Old Pale (V.S.O.P. ), sometimes also called Very Old (V.O. ), has a minimum age of four years; Extra Old (X.O.) is at least six years old. A cognac maker's cellar master blends and cuts different vintages to produce a cognac of the desired color, smell and taste, and the age requirements refer to the youngest liquid in the mix. Beyond the official categories, there's no limit, and most cognac houses let their proudest beverage mature much longer. Jean Balluet's Very Special is six years old, but it tastes a bit on the sharp side. The Très Vieille Réserve, aged for 18 to 20 years according to my guide, is velvety beyond belief. I buy three bottles. To top off the experience, I make my way to Cognac. The quiet town is most charming in its medieval quarter, a maze of ancient buildings and narrow cobbled lanes that gracefully slope to the river Charente. The riverbank is lined with grand grey buildings flying the flags of Hennessey, Martell and Rémi Martin. All of the big cognac houses can be toured, some only by reservation and all for a fee. After a brief contemplation, I pass. Each one of the flashy tours is only slightly less expensive than one of the bottles I bought earlier.